BLUEBERRY, SUNSHINE BLUE (Vaccinium Sunshine Blue). Fruit. 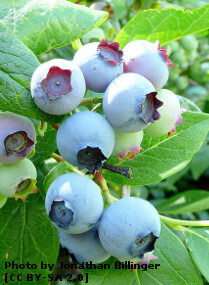 Hardy and productive, high yields of large, light blue, firm berries over a long period from late July and throughout August. About half of the blue-grey leaves turn an eye-catching red in autumn before falling and the remainder stay on the bush all winter. This variety is self-fertile. Plant in a sunny site, sheltered from strong winds and in a lime-free soil. Plant 2-3ft (60-90cm) apart.